Parade season is upon us again! 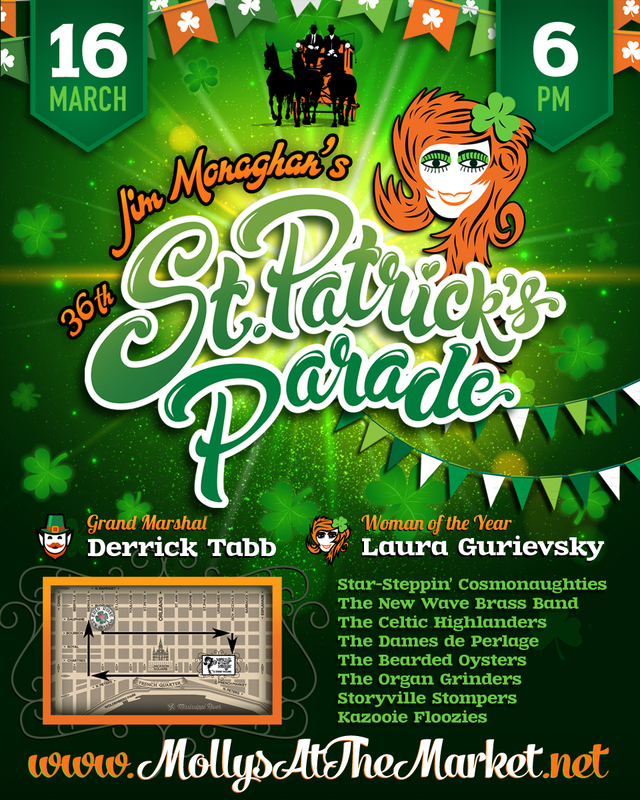 Please join us for our 36th Annual St. Patrick's Day Pub Crawl and Parade on Friday, March 16, 2018. The festivities begin at 8:00 a.m. with breakfast and registration for the day's activities. The black-tie pub crawl limos and executive vans leave Molly's at 9:30 a.m. on a tour of five of our favorite bars in New Orleans. After a brief break, we load up onto mule-drawn carriages that evening to parade through the streets of the French Quarter. Join us for the pub crawl, the parade, or make a day of it and come along for both! Full day tickets are $250.00 per person. Half day tickets (pub crawl or parade) are $125.00 per person. Grab your tickets today on our store page! https://www.mollysatthemarket.net/shop/ Prices increase following Mardi Gras Day (February 13, 2018).